Consolidate the coding process with the one-stop resource developed exclusively for those who code for orthopaedics. 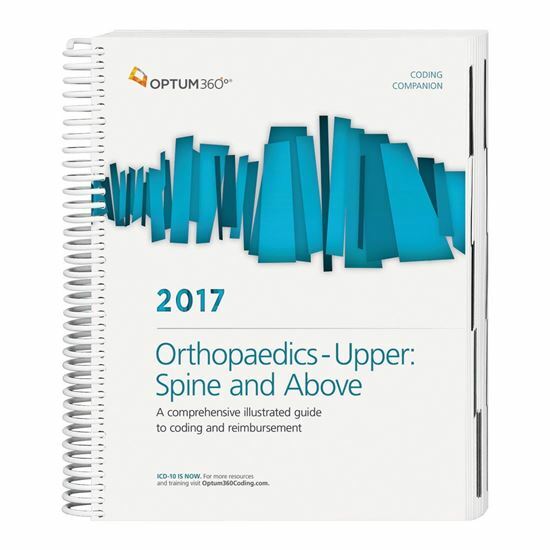 This comprehensive and easy-to-use guide includes 2017 CPT®, HCPCS, and ICD-10-CM code sets specific to orthopaedics. Each specialty specific procedure code includes its official description and lay description, coding tips, terminology, cross-coding, and national Medicare relative value units. Getting to the code information you need has never been so easy. New — Optum360 Edge — Documentation and Reimbursement Tips now included right on the page. Documentation and reimbursement information for procedures included for quick reference. Optum360 Edge — HCPCS Procedure Codes. Only Optum360 offers HCPCS procedure codes specific to your specialty with the same information as we provide for CPT® codes. Quickly find information. All the information you need is provided, including illustrations, lay descriptions, coding tips, terms, cross-coding, and Medicare RVUs and Pub. 100 references. Organized by CPT® and HCPCS procedure code. Essential procedures for orthopaedics are listed by CPT® or HCPCS procedure code, along with crosswalks to ICD-10-CM diagnosis codes.